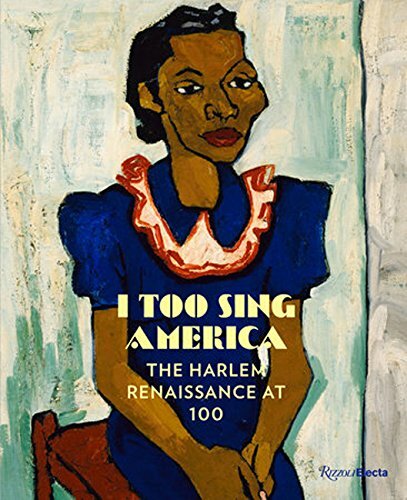 The Columbus Museum of Art commemorates the centenary of The Harlem Renaissance with an exhibit titled I Too Sing America, which is also the title of the beautifully curated companion book published by Rizzoli Electa with over 150 prints of paintings, sculpture, photographs, portraiture, and text by African Americans artists from the legendary era. Along with the artwork, award-winning Boston Globe journalist and biographer Wil Haygood chronicles the social, political, and cultural impact of the era. From its beginnings in the aftermath of WWI in 1918 through the 1930s depression, African American artists and writers worked to define their own aesthetic and culture outside the influence of the white establishment. Langston Hughes’ 1926 poem “I, Too” is printed on a title page of the book to express the impact of generations of victimized by government sanctioned discrimination, oppression, lynching, and violence. Haygood’s stream of consciousness commentary gives scope and context to how art and politics intersected in Harlem. Harlem was emblematic of a cultural revolution that extended beyond New York, and the renaissance was a platform that confronted racism, oppression, and inequality. It empowered millions of African Americans then and for generations to come. Haygood and art scholars annotate the over 175 images in the book with stories of the scene in Harlem as black artists bypassed the Eurocentric aesthetic of the white art establishment and created their own visual art, literature, and music by and for the African American diaspora throughout the country. Savage and realist painter Charles Alston cofounded the Harlem Artist Guild and Savage eventually was an administrator for Roosevelt’s WPA’s Federal Arts Project and secured 200 Harlem area artists for jobs. Savage forged ahead in Harlem, she became an art teacher to African American students, where classes were free. Among her students were two of the 20th century’s most revered American artists, Jacob Lawrence and Norman Lewis. More than anything, this collection is a panoramic retrospective of Harlem visual art from the Afrocentric deco paintings of Aaron Douglas, to watercolors by E. Simms Campbell, and abstract impressionist Beauford Delaney; portraits by Edmund Archer, Winold Reiss, and Malvin Gray Johnson; also the expressionist masterpieces of Romare Bearden and Lois Mailou Jones’ stunning The Ascent of Ethiopia that depicts black history from its roots in ancient Africa to Harlem’s illuminated skyline. The book also includes many stunning photos capturing everyday life of Harlem families that include dozens of prints from famous photographers like James Van der Zee who shot studio portraits of typical Harlem families, but also gay and transgender luminaries who performed in Harlem theaters and nightclubs. The breadth of the artwork in I Too Sing America—the paintings, photographs and text—makes this is a vital collection. Of course, nothing can substitute seeing painting, sculptures and photographs in person at the Columbus Museum. The exhibit is on display from Oct. 19, 2018-Jan. 20, 2019—but if you can’t visit the museum, the book I Too Sing America is the next best thing.